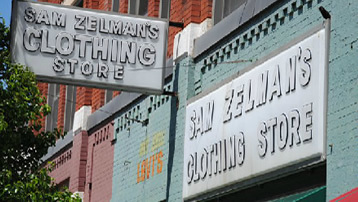 Sam Zelman immigrated here from Czechoslovakia in 1920 and started his Zelman's clothing store at the corner of Douglas and St. Francis in Wichita in the '20s with the intention of bringing his family here once he got established. However, by the time he was able to do that, Hitler was taking power and it was too late. Zelman's daughter, Esther, was forced into a concentration camp. She and her future husband, Herbert Moses, later met at a liberation camp. Herbert Moses joined Zelman's in 1948 and ran the shop with Sam Zelman until Zelman's death in the early '70s. Then Herbert and Esther ran the shop together until Herbert's death in 1991. Esther Moses remained a well-known fixture at the shop, which she walked to almost daily from her College Hill home, until 2006 when she was physically unable to come to the store anymore. The clothing store closed in 2006 and the building remained empty until 2011. The second floor of the building at one time was a hotel. 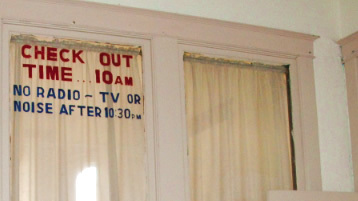 Today, this historic landmark is home to six studio and three one-bedroom upscale lofts. The ground floor houses two creative agencies and a coffee house. Contact us to make Zelman Lofts your new home!